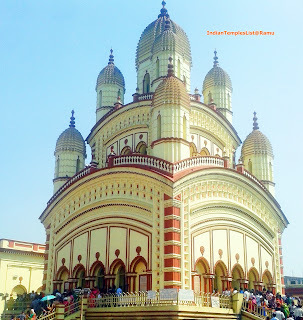 Dakshineswar Kali Temple present on eastern bank of the holy Hooghly River (Hoogli or Hugli) is a famous historical temple in Kolkata, West Bengal state of India. The temple is dedicated to Goddess Kali, worshipped here as Ma Bhavatarini. The temple is visited every year by a large number of local devotees and travelers. 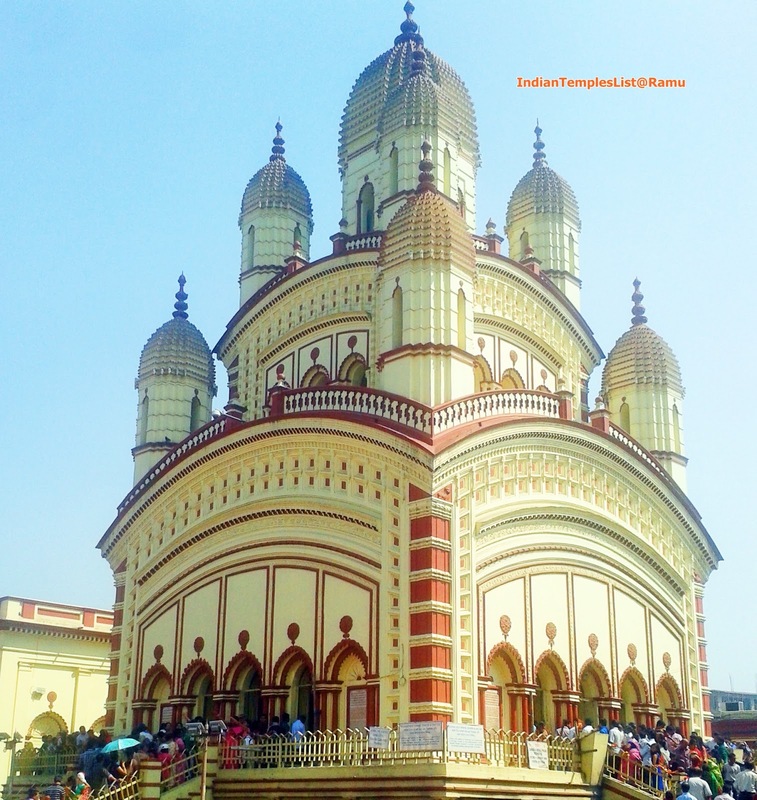 The sacred temple was built by Rani Rashmoni of Janbazar in the year 1855 (mid 19th century). She is a philanthropist and a faithful devotee of the Hindu Goddess Kali. She remained closely associated with the famous Indian mystic and yogi Sri Ramakrishna Paramahamsa (Gadadhar) who lived in the 19th century after she had appointed him as priest of the Dakshineswar temple. Paramahamsa has credited Rani Rashmoni as one of the 8 companions of Goddess Durga. Rani Rashmoni died at the age of 68 on February 19, 1861. Once, Rani (Queen) Rashmoni prepared to go to the sacred city of Varanasi (Kashi or Banaras) to express her faithful devotion to the Mother Goddess Kali. But, Goddess Kali appeared in her dream and ordered her to construct her temple in Bengal itself. Rani Rashmoni immediately bought a built the beautiful and famous 12-spired Dakshineswar Kali temple complex on the banks of sacred Ganges at Dakshineswar between 1847 and 1855. The temple architecture is built in Bengal style. The main temple has a shrine of the Goddess Bahvatarini, Dakshina kali and is surrounded by twelve other temples dedicated to Lord Shiva and Radha-Krishna. An elderly scholar named Ramkumar was chosen as the main priest of the temple. His younger brother, Sri Ramakrishna Paramahamsa, then known as Gadadhar Chattopadhyay together with his nephew Hriday, became assistants of Ramkumar at Dakshineswar Temple. Ramkumar died in the year 1856 and Gadadhar (Ramakrishna Paramahamsa) took over his place as the chief priest of Kali temple. 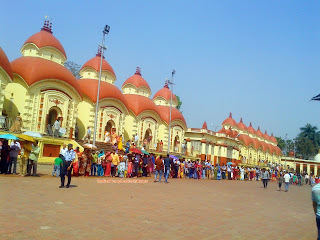 Dakshineswar Kali temple gained a great fame during Ramakrishna Paramahamsa stay in the temple of Dakshineswar for thirty years. It is at Dakshineswar, Sri Ramakrishna Paramahamsa attained his spiritual vision and preached among the followers and devotees - the unity of all religions. The temple is neatly maintained by the trust today. From October to March: 6:00 a.m to 12.30 p.m and 3:00 p.m to 8:30 pm. From April to September: 6 a.m to 12.30 p.m and 3:30 p.m to 9:00 pm. Kolkata, formerly known as Calcutta, is the capital of West Bengal state in India. The city has many holy temples known for their beautiful architecture and artistic forms. 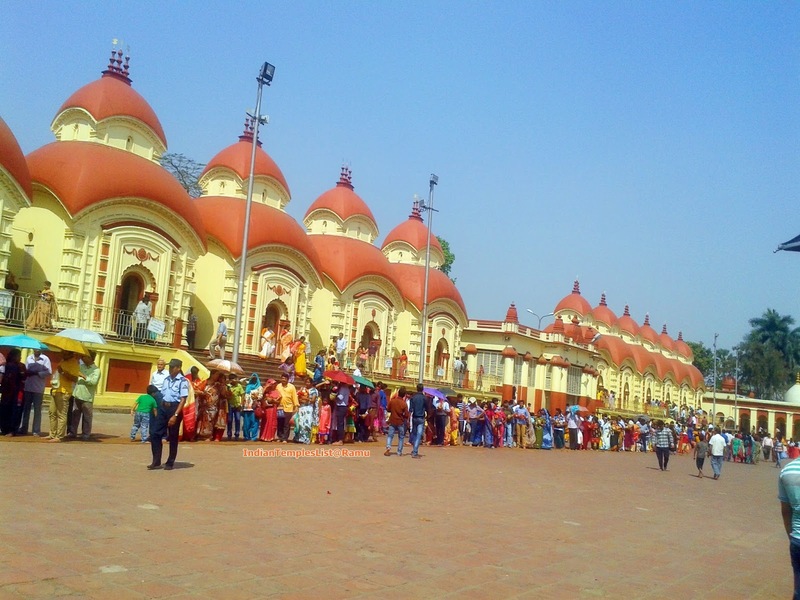 Another famous temple worth a visit in Kolkata is the Kalighat Kali Temple. It is considered one of the 51 Shakti Peethas of India. Bengali is the official state language spoken in Kolkata. Other languages spoken by the people who reside in Kolkata are Hindi, Urdu and English.